I am born and bred on the Norfolk Broads, and for most of my life I have had the pleasure of sailing here on everything from the smallest dinghy (admittedly about 15 stones ago) up to each of the remaining wherries. I was for 20 years Managing Director of The Norfolk Broads Yachting Co, one of the oldest names in Broads Yachting and I am privileged to have worked alongside some of the most skilled tradesmen to be found. In that time I have, along with many others with a like interest, amassed much information on the place where we live and take our pleasure. This web-portal is not by any means the authoritative reference on the Norfolk Broads nor anything approaching it, there are many that know a lot more than me and may have far more interesting material to impart, but this is simply my contribution as an information point for those that are looking for more on this, one of the finest inland waterways in the world. 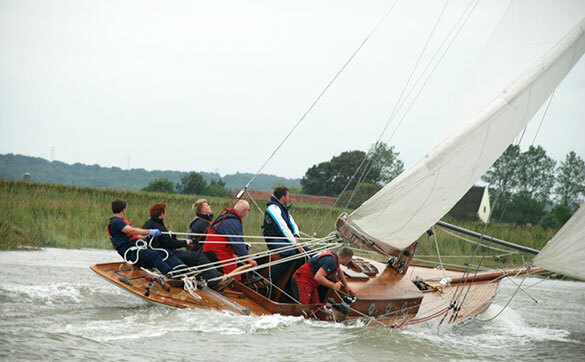 Much of my interest surrounds the yester-year of the Broads, and particularly the history of yacht racing that took root here over 200 years ago and flourishes to this day. I am sometimes able to provide information on old sailing craft, via an extensive archive, including one of the only complete collections of Lloyds Yacht Registers still in existence, with every published volume from 1878 through to 1980. Included for your interest, are galleries of quite atmospheric black and white photographs from days gone by, along with more recent pictures and links to other sites. The site is very much work in progress, there will be further additions over time but for the moment, I hope you enjoy our modest contribution.